Future Quest #1 – Hanna Barbera’s greatest action heroes, including Jonny Quest and Space Ghost, all in one comic? Yes please! Doctor Fate #12 – Though it hasn’t been in the “Rebirth” line-up yet, I hope this series comes back. It was easily one of my favorites, post-Convergence, and I’d like to see his world explored a bit more. Wonder Woman #52 – I admit that I was a bigger fan of the Azzarello/Chiang run than this current one, but it has turned around in the last few issues. I’m excited to read the conclusion of everything Diana has been working for these last (almost) five years! Batman #52 – Snyder/Capullo are gone! I like Tynion and Albuquerque just fine, in fact they are some of my favorites, but it feels weird that the original team, the ones that have been on Batman for almost the entire run since the New 52 began, won’t be there for the final issue. Should still be a great issue though. Robin: Son of Batman #12 – This is one series that I don’t necessarily feel needs to continue, but I hope Patrick Gleason will continue to write/draw for Damian someday. I’m sure issues #11 & #12 will be great with Fawkes/Bachs, but Gleason’s work on Batman & Robin and on Son of Batman have been the stuff of legend. We Are Robin #12 – This is a series that I hope will continue. It quickly became a fan-favorite, and while the Previews synopsis sounds like it’s ending, I have a hard time believing it will be gone forever. Renato Jones: The ONE % #1 – …wait, what? A vigilante seeking revenge/justice on the top 1%? I bet it’s Bernie Sanders… But seriously, the concept sounded a bit like any Occupier’s fantasy come true, but after seeing some art I may have to check this out. 3 Floyds: Alpha King #1 – Based on actual brewery in Munster, Indiana, dimensions are broken for a taste of a special homebrew! Black Road #2 – Brian Wood returns to Viking-times! See also: Northlanders. Punisher #1 – I’ll admit, I’ve never read a Punisher book in my life, but with Becky Cloonan writing, I might just start here. Beasts of Burden: What The Cat Dragged In (One-Shot) – The last Beasts of Burden story I read was the Hellboy crossover in 2010, maybe it’s time to jump back in. As Dark Horse says “This standalone adventure is a perfect entry point for readers new to the award-winning series.” Does this mean more is coming soon? Lobster Johnson: Metal Monster of Midtown #1 – Robot bank thieves! I’ve really been enjoying the Lobster Johnson mini-series and one-shots over the last couple years, and this series doesn’t look to disappoint either. The fact that the franchise is released entirely in mini-series and one-shots lends to the reader-friendly “jump on at any point” method. But once you’ve read this, I highly recommend checking out the rest. Mae #1 – A girl travels to another world for many years, but when she returns the monsters come with her. Sounds a it similar to Image’s Birthright (which I like) so I’m going to give this one a shot. Hero Comics: A Hero Initiative Benefit Book – Neil Gaiman, Howard Chaykin, Kurt Busiek, Sam Keith, Kevin Eastman, Rob Guillory, Ashley Wood and more all in one book?! How could I say no? I don’t have a whole lot to say about May’s solicitations. It’s kind of an in-between month in a lot of ways. Beasts of Burden is coming back for a new one-shot! I love this title. I imagine that most of the DC titles I enjoy (Black Canary, Omega Men, Midnighter) are not coming back in June. I also don’t know if I’m going to be sticking with Batgirl or Suicide Squad, so this could be the last month I’m preordering any DC books for the time being, except for Sheriff of Babylon. I’m looking forward to the June solicitations, in hope that I’ll be pleasantly surprised by the creative teams. I’m cautiously optimistic about Micronauts. I loved the Marvel title, and trust Cullen Bunn to make this interesting, even if he can’t include Bug. This is not a particularly exciting month for Image, with only one new title (Renato Jones: The One Percent) catching my eye. Still, any month at Image is a good month. I’m on the fence about Civil War II. I know I’m going to end up reading it, but I wish it wasn’t happening at all. I’m beyond fatigued with events. I’m curious about Punisher by Becky Cloonan, but wish that the artist was more exciting than Steve Dillon. I like his work, but think someone with sensibilities closer to Cloonan’s would be a better fit. I’m still more excited about Black Panther than any other title anywhere. The 4001AD event should be good, although I hope there aren’t too many tie-ins beyond whatever’s happening in Rai. Boom: The MMPR: Pink mini is as good as bought. Cry Havoc also ensures I’ll be looking at Simon Spurrier’s other book launching in May, Weavers. Dark Horse: Gene Ha’s title Mae looks fantastic. I’ve heard the pitch somewhere before, but I can’t recall and it’s too good a story idea to pass up on. DC: I can’t believe it’s been 52 issues of Burnside Batgirl. Time flies. Aside from that, May kills the few titles I read at DC. June lives or dies by the creative team announcements for this new chapter. Marvel: Thanks for spoiling Captain America for us, Marvel. I can’t even feign surprise. I’m down for Cloonan on Punisher curious to see how Steve Dillon works for her style. Jim Zub on Thunderbolts piques me. No interest in Civil War II, though I’m sure I’ll read it via friends so I can stay up to date. Will Scarlet Witch make it past six issues or will Marvel axe it? I want it to stick, but Marvel loves that six issue mark for the chopping block. Looks like I’m webbed into this Spider-Women crossover. Oh, there’s Apocalypse Wars, too. There’re a lot of artists not where I expect them, but maybe I haven’t been paying attention. Where’s Stacey Lee on Silk? Ken Lashley on Uncanny X-Men is a welcome surprise. Image: Monstress out of commission until August. Other than that, Image as usual. IDW: The father of cyberpunk and modern sci fi stepping into comics? William Gibson’s Archangel should be a treat. Valiant: Looking forward to 4001AD. I’ve only read a few titles from the New 52 launch. So, I’ll pick up the final #52 issues of those series: Aquaman, Batman, Flash, Green Arrow and Wonder Woman plus issue #51 of Justice League. I also enjoy and will pick up DC’s villain-centric ongoing series with Deathstroke #18, New Suicide Squad #20 and Sinestro #23 plus the Suicide Squad Most Wanted: Deadshot / Katana #5 mini-series. Other faves of mine, with characters I’ve followed since I was a boy, whose series I will continue to read in May 2016 include Earth 2: Society #12, Teen Titans #20, Batman Beyond #12, and Superman / Wonder Woman #29. Other mini-series that will be picked up by me include Omega Men #12, Titans Hunt #8, Superman: Lois and Clark #8, Green Lantern: Edge of Oblivion #5, and Bloodlines #2: Foresaken. These all have been pretty good and the last book, Bloodlines, has had its first issue ship yet, but I will sample #1 to determine if #2 is worth picking up. I also plan to try out Future Quest #1 as it seems like a great book to see as many Hanna-Barbara characters as possible. I’m not that intrigued by the Scooby Doo reboot so that won’t be bought despite me being a HUGE Scooby Gang fan. I don’t read many Marvel titles, but I will be sampling Thunderbolts #1 as the series seems to be getting back to its roots and now also includes the Winter Soldier. I will also continue to read Squadron Supreme and pick up issue #7. Great series and creative team. 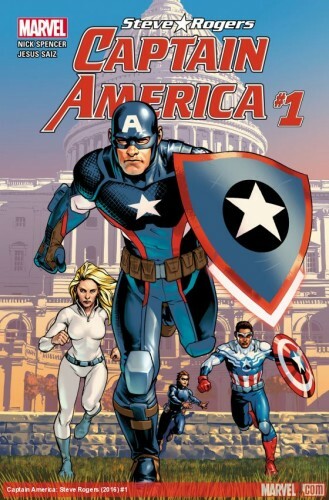 Lastly, I may sample Captain America: Steve Rogers #1 solely on my enjoyment of Jesus Saiz art. I’m a long-time fan of the immortal brothers Anni-Padda, Bloodshot and Ninjak, so it won’t surprise you that I will be continue to pick the following series in May 2016: Wrath of the Eternal Warrior #7, A&A: The Adventures of Archer and Armstrong #3, Bloodshot Reborn #13 and Ninjak #15. Also, Valiant does good event mini-series so I’ll also be picking up 4001 A.D. #1 (of 4).